The Hacket Valley offers some of the best dog-walking in the region, with the opportunity to visit the sparkling Whispering Falls, a disused chromite mine, the wooded valley of the Hacket and its tributaries, and - for the more adventurous - some stunning areas of hill-land. To take your dog, you'll need a permit, but this is free and easily obtained from the friendly staff in the local DoC office (Nelson) - so don't let that deter you. The best access to the walks is from the Hacket Valley reserve, near the end of the sealed section of Aniseed Valley Road. This well-maintained reserve offers toilets and a camping area for those who wish to stay over in the area. It also gives access to a local swimming hole, beneath the bridge at the start of the walk. From there, the track winds up the valley, initially as a forest road, and then as an easy walking track, to the next river crossing, over a bouncy suspension bridge. After that, the trail slowly becomes more demanding, with sections along a narrow bench above the river, a few slips and screes, and one or two brief scrambles, before it drops down to the river again. Here there are two options. Left takes you along the river for 100 metres or so, and then invites you to rock-hop across to a steep little bluff on the other side. 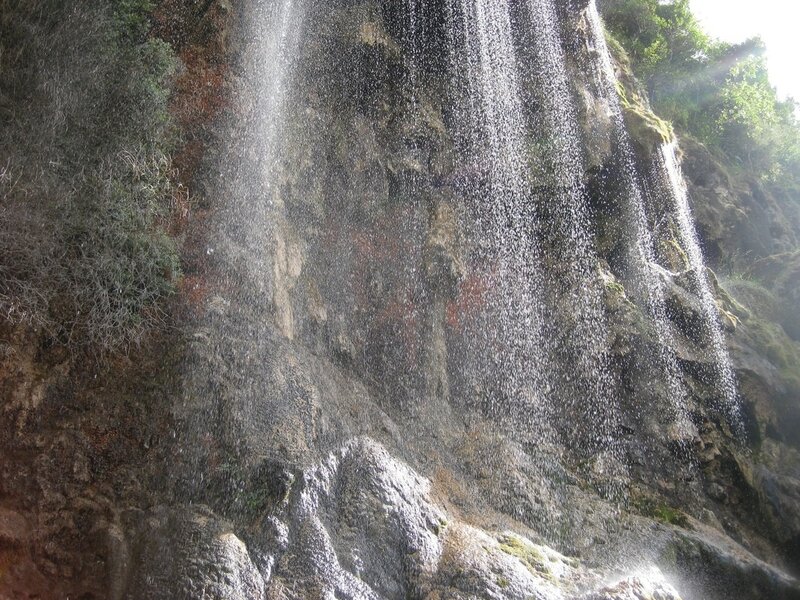 This way is well worth the risk of a wet foot or two, because if you follow the track on the other side, cross the river bridge, then climb up the twisting path across the area of travertine (aka tufa or fossil sponge), you'll enter the magic world of Whispering Falls. The alternative route takes you on into the Richmond Ranges: either to Hacket Hut (about 30 minutes) and then to Starveall (about 4 hours), or to Browning Hut (about 2 hours) and then to the Pelorus River. By either of these routes, there's also further access, either south or east. Another option is to take a side-track from the main track about 1 km past the Whispering Falls junction, right (south) up to the disused Chromite Mine. It's a steep climb, but the mine is interesting, with a number of short adits showing residues of the silvery-looking chromite that used to be mined here, and the trail then leads on, round in a wide loop via Serpentine Saddle, to rejoin the Hacket Track back, about 1.5 km before the Whispering Falls turning - and about 20 minutes from the car park. All these walks are guaranteed to be a treat. The scenery is varied; the river is a constant companion for much of the way; there's plenty to explore; and there are always different options to choose - so it's a walk to do not just once, but many times. For me, an undoubted favourite.